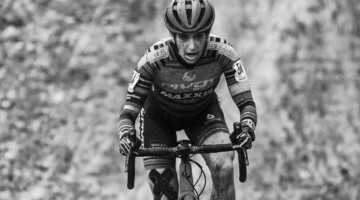 With cyclocross season fast approaching, we’re helping you get your body and mind ready with our #crossiscoming series of articles. This installment features a review aimed at anyone who dreads the time on a trainer but can’t always train outdoors. With the summer equinox come and gone, the days are getting shorter, and in due time ’cross will indeed be here. 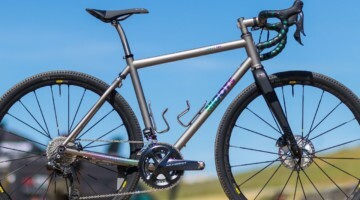 The coming of the beloved cyclocross season is no doubt exciting, but at the same time, for many of us, it means trainer season is coming again as well. Fortunately for cyclists in 2018, trainer season is not what it once was. 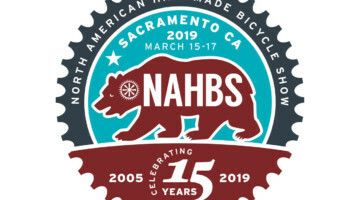 Smart trainers and training applications offer a more interactive indoor training experience than plugging away at the rollers while listening to music or watch old race replays. One of those training applications is Zwift. 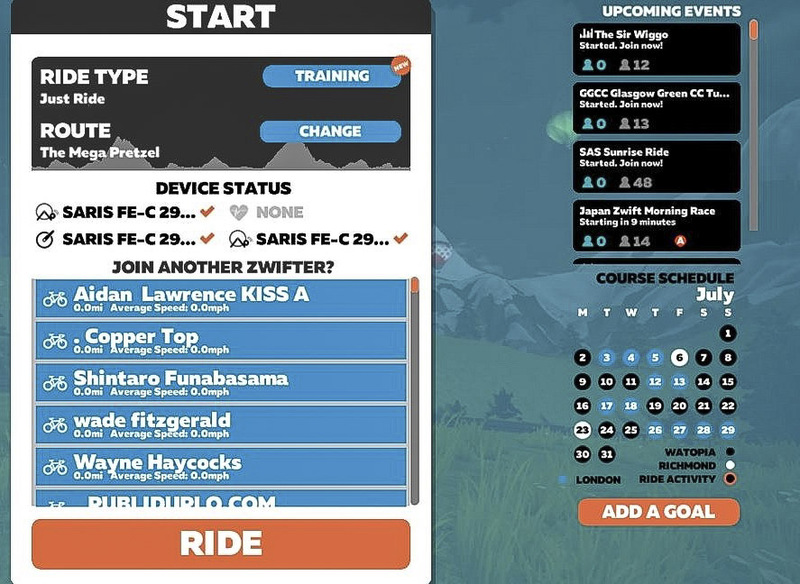 At this point, Zwift seems to need no introduction, with many folks in the cyclocross community having already used it or at least developed several hot takes about the program. If you are still unfamiliar, the Zwift app allows you to ride, race and train in three virtual worlds from the comfort of your home trainer. Anecdotally, the video-game-like Zwift has encouraged some athletes who would not otherwise use the trainer to add indoor riding to their offseason training. Over the past several months, I have kitted up my virtual avatar and joined thousands of other cyclists from across the globe in Zwift’s virtual worlds. Now a seasoned level 13 Zwifter, I have returned from Watopia to offer my thoughts on the virtual training program. 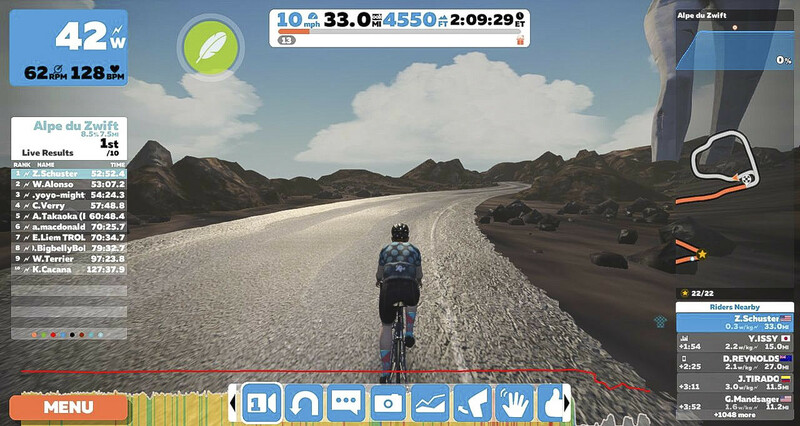 Zwift even has some gravel! Zwift review. 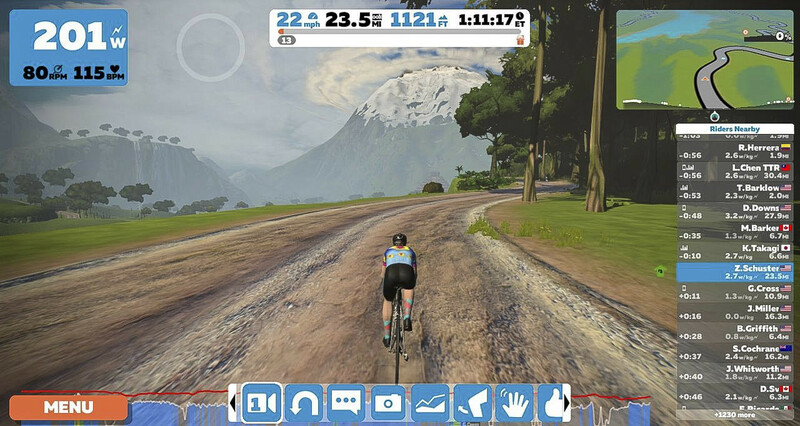 Zwift is available for Windows, Mac and iOS operating systems. Once you download the software, Zwift offers a seven-day free trial if you want to try it out first. Memberships are $15/month and are renewed on a monthly basis. Zwift works best with modern smart trainers, but it is not limited to the pricey turbo machines. 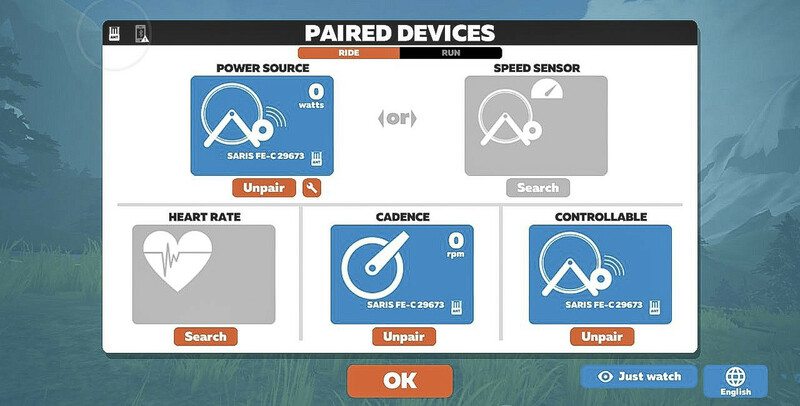 You can use Zwift with a classic trainer or rollers by pairing a speed or cadence sensor with the program’s built-in zPower program that estimates power based on your inputs and trainer-specific power curves. Zwift also accepts power input from traditional power meters that communicate via Ant+. The best way to use Zwift is with a smart trainer that measures power and adjusts resistance based on the program’s virtual course. 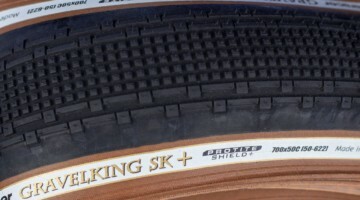 Examples of smart trainers we have reviewed in the last year include the Elite Drivo, CycleOps Hammer and Wahoo Kickr. When you first start Zwift, a screen pops up asking you to pair your trainer and sensors with the application. Connecting a smart trainer with Zwift can be a bit challenging at first. Depending on your computer’s age and capabilities, you may need to get either an Ant+ or Bluetooth dongle. 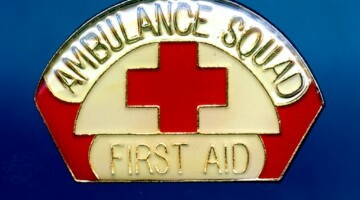 However, some computers have them built-in and iPhone can connect via Bluetooth. Zwift pairs with your trainer and sensors using either Bluetooth or Ant+. Zwift review. Zwift designed its program to mimic real-life physics as best a virtual training application can. How fast you climb and descend is based on your height, weight and even which virtual bike you are riding. Thus, before getting started, it is probably best to customize your virtual self. Zwift allows you to input your height and weight and then select your kit and bike. More bikes, wheels and clothing options become available as you progress through the game’s 25 levels. Level upgrades occur more or less based on how much you ride in Zwift. 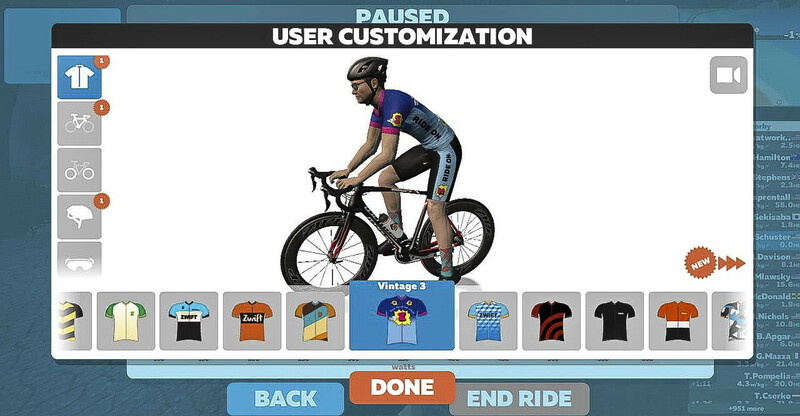 Zwift allows you to personalize your virtual self with kits, socks, bikes, wheels and more. Zwift review. The Zwift game currently has three different virtual worlds that are set based on a pre-determined schedule for any given day. 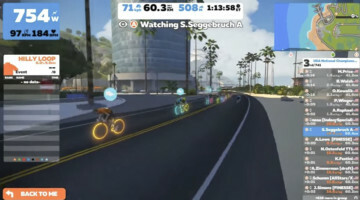 The most commonly used world is Watopia, which is Zwift’s virtual creation. Watopia features the most miles of roads and the most challenging physical features. The London world takes you through downtown London and across the Thames to two fictional pastoral climbs up Leith and Box Hills. The third, and least used, is Richmond, which mimics the 2015 Worlds Road Race course. There are four primary ways to ride in Zwift: free ride, a group ride, workout mode and racing. I will next describe each mode. The first option for using Zwift is to just go ride your bike in the virtual world of the day. It is just like going for a ride on your favorite roads, if those roads were fake and depicted using semi-real computer graphics. 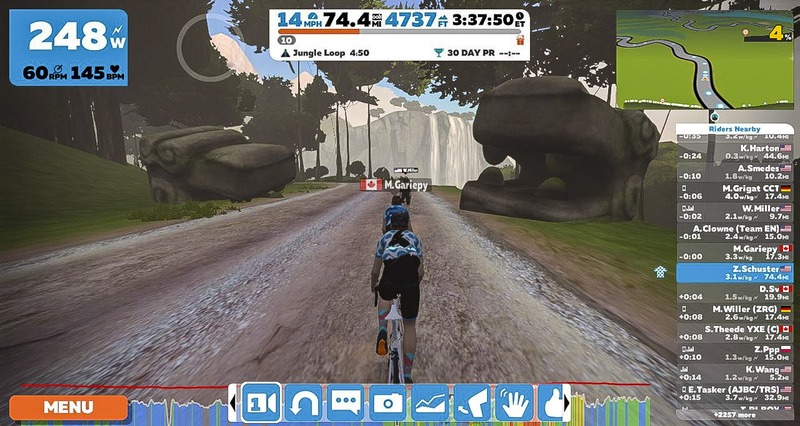 Like the real world, Zwift’s worlds feature a series of interconnecting roads that traverse the virtual landscape. 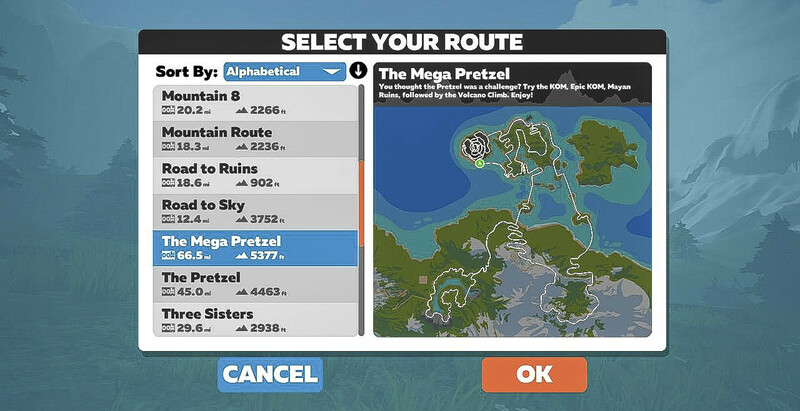 For each of the three worlds, Zwift offers defined routes that are a good option when you first learn the different roads of each world, but once you get a hang of it, you can choose your own route. Each world has a number of preset routes you can ride. You can also choose your own adventure. Zwift review. 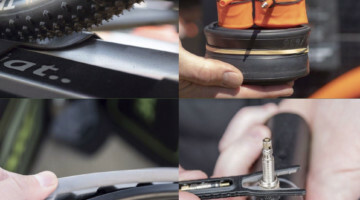 The terrain changes often, so if you are riding with a smart trainer, the resistance will be constantly adjusting. I have found that being constantly engaged in the ride, similar to the real world, makes time on Zwift go by much quicker than it does just riding the trainer. As you ride, you can see the virtual personae of the other Zwifters active at the same time. 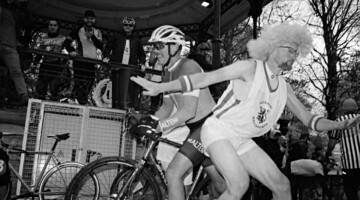 Want to go full MAMIL and outsprint every person around you? You can definitely do that. One of the challenges I faced when first using Zwift was that it features a number of in-game climb, time trial and sprint QOM/KOMs. It’s not that I do not like segments, it’s that when there’s a segment to go for, you go for it, right? It seemed like a good idea for a while at least. The QOM/KOMs feature in-game leaderboards for all active riders. The rider with the top time for each gets a jersey for up to 60 minutes while they hold the top spot. If you are looking to add intensity to your workout but struggle to find the motivation to do long, hard efforts, these segments provide a real feel of going all out and could be a benefit when the training plan calls for a big indoor effort. 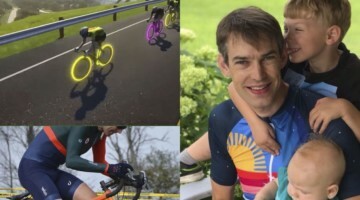 Zwift shows segment leaderboards and gives out jerseys to the leading active rider. Zwift review. 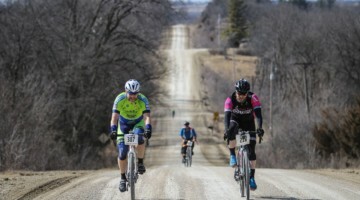 Prior to 2018, the biggest climb in the game was Watopia’s Epic KOM, which features about 1,300 feet of climbing crammed into 4 miles in one direction and 6 miles in the other. Earlier this year, Zwift added the Alpe du Zwift climb, which mimics its famed namesake Alpe du Huez. Alpe du Zwift has 3,400 feet of climbing and like the real thing, it is really really challenging. Alpe du Zwift only becomes available when you hit level 12, so it will take some riding before you can emulate your favorite Tour pros. Zwift claims that one of the goals of its application is to create a virtual community of real people riding bike trainers in their respective basements. 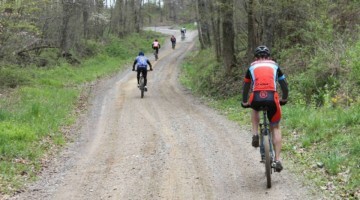 One big part of this community building is the many group rides offered every day. Group rides work in a couple of ways. One is the traditional group ride where the leader sets the pace and the group stays together with an occasional hill sprint. Usually rides have a set W/kg target and seem to do a pretty good job of sticking to that target. I would recommend checking out the Zwift’s event page and reading up on the upcoming group rides. I ended up in one with a target power of 1.6 W/kg, which ended up requiring some little ring spinning to not go rocketing out of the group. A second type of group ride is one where everyone in the group rides a prescribed workout while “riding” together as a group. The workouts are set based on percent of Functional Threshold Power, so everyone does the workout according to their capabilities. I have not tried one of these, although the thought process seems to be that it is motivating to have other virtual people suffering alongside you, where ever they may be in the world. Got a coach who assigned you intervals? Need some structure in your life? Zwift’s workout mode might be the perfect feature for you. 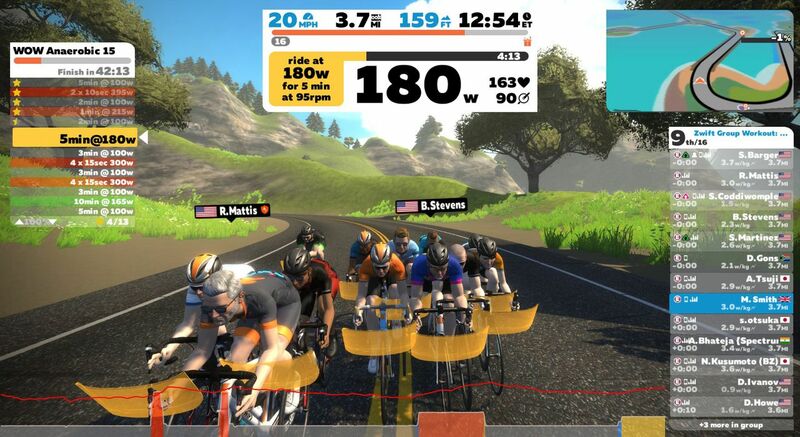 Zwift allows you to load a pre-programmed workout and ride it in the virtual world of the day. With a smart trainer, one way to do workouts is in “Erg mode,” which adjusts the resistance based on your cadence to hit the prescribed power. For example, if an interval calls for 250 watts, a smart trainer will keep you at (or near) 250 watts as you adjust your cadence. You can also do workouts in a free ride format where you try to hit the prescribed power numbers. 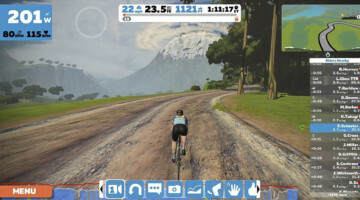 Zwift includes a number of pre-set workouts and progressive training plans, so even if you do not have a coach, you can select workouts for skills you want to develop. 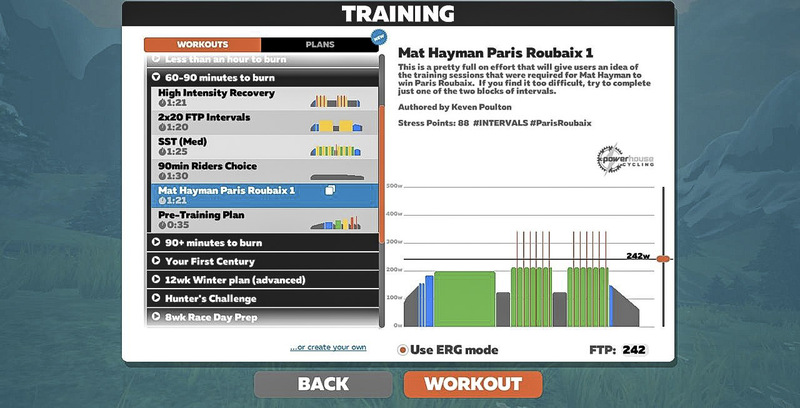 One cool feature is you can also play coach Mayhew and develop your own workouts with set power and cadence intervals. The Zwift Companion app for your phone also allows you to set resistance via slope for some intervals. Zwift has a number of built-in workouts that can you do in Erg mode or by trying to match the prescribed power. Zwift review. I mentioned earlier that I often find myself going after the in-ride KOM segments; I have found the workout mode incredibly useful for easier Zone 1 and 2 workouts. I can create a workout with 1-2 hours of 50-70 percent of my FTP and not have to worry about going too hard while putting in miles and racking up points toward a level upgrade. Finally, we get to what some of you likely came here for: Zwift racing. Aka the fake bike racing that is ruining real bike racing. Or so I have heard from some corners. In sport, history has shown that athletes will often do what they can to gain an edge on their competition. In a (virtual) world that relies on athletes accurately reporting their heights and weights and where trainer calibrations may vary, it is probably best for most of us to take Zwift racing with a grain of salt. Like many things in the game, racing categories in Zwift are based on watts per kilogram. Categories are defined by W/kg at FTP, which you can manually enter based on a power test, or Zwift will continually update it by taking 0.95 of your best 20-minute power number. The categories are: A: 4.0 W/kg or higher, B: 3.2-4.0 W/kg, C: 2.5-3.2 W/kg and D: under 2.5 W/kg. If you are honest about your weight, Zwift racing should provide some motivation to avoid putting on pounds during the holidays and the long winter months as you try to boost your racing W/kg. Unlike real racing where you usually have to wait for the weekend, there are countless Zwift races every day. And since Zwift is a worldwide phenomenon, there are Zwift races literally all day. The main menu shows you upcoming races and group rides. Zwift review. Like the real world, Zwift races are usually either flat or hilly. The Watopia courses tend toward the hillier side, while the London races are a mix of flat criteriums and hilly jaunts up Box and Leith Hills. Despite riding quite a bit on Zwift, I admittedly have not ridden in the Richmond world yet, so I cannot speak to what the races are like there. I assume they follow the Worlds course? Races are typically 20-30km long, although some do push up to 60km. 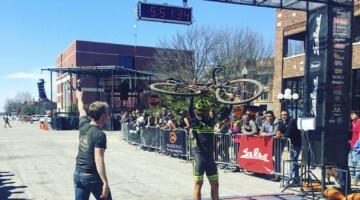 I might write about this further at some point, but the race lengths seem almost perfect training for all-out 30-60 minute efforts at threshold to prepare for cyclocross season. When you decide to enter a race, Zwift takes you to a virtual warm-up zone, where you free ride on a virtual trainer as more and more riders join at the starting grid. Many of the races allow power-ups, and my friend who is very good at Zwift racing tells me you cannot win a Cat A race without the aero power-up, so it likely makes sense to ride a bit before racing to snag a pre-race power-up. Cyclocross racers are likely to feel right at home in Zwift races. 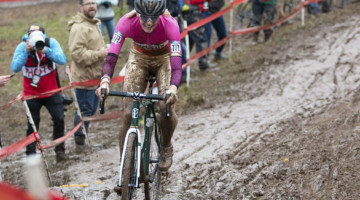 Races usually have frenzied starts that are reminiscent of cyclocross holeshots. If you manage to not get dropped at the start, Zwift’s faux physics have drafting built into them, so the pace does settle down a bit, provided you can master the physics of Zwift drafting. 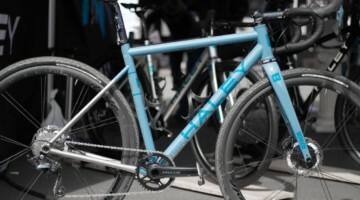 Once the hills start, it is usually back to cranking near threshold, as one might experience during a cyclocross race. The two races I did both finished on hill climbs, and what I found is the finishing order largely broke down based on W/kg, which takes some of the excitement out of the racing. I cannot speak for the “crits,” but for the hilly routes, the races at some point turned into 30-60 minute time trials, more or less. 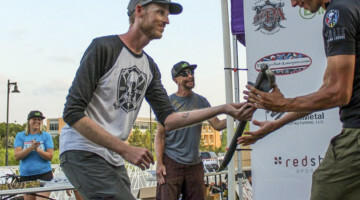 The crossresults.com of the Zwift world is zwiftpower.com, which gathers results from the different Zwift racing organizations and hands out rankings and all that fun stuff. Included with Zwiftpower is, I kid you not, the Zwift Anti-Doping Agency, or ZADA. 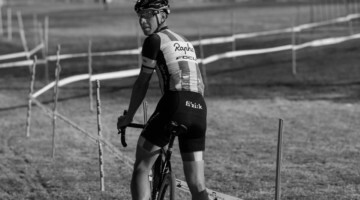 ZADA flags riders who hit 6 W/kg for 5 minutes and uses heart rate data to monitor people who may be weight doping. I live in Wisconsin, so I have done a lot of indoor riding since I started cycling. I have used spin bikes at the school gym, ridden a “dumb” trainer in my apartment kitchen, paired an early smart trainer with other training applications and used Zwift with my direct-drive trainer. Zwift is better than all the other indoor training options I have tried. The interactive worlds that require constant shifting make time go by as quickly as it can on a trainer. With Zwift, I was able to survive winter riders of 3, 3.5 and 4 hours without going crazy. I do not think those rides would have been possible with a traditional trainer and a Netflix queue full of Law and Order reruns. 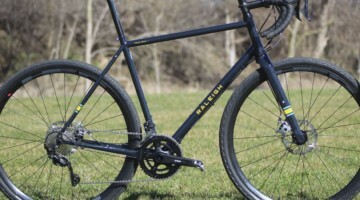 Zwift made long winter rides less worse. Zwift review. The four options of free ride, a group ride, workout mode and racing provide different ways of using Zwift that can be incorporated into a polarized winter training model or whatever training regimen you use. If you want to add some intensity or go after “peak Zwift form,” as my buddy calls it, Zwift racing is a fun and challenging way to ramp your training up on the trainer. 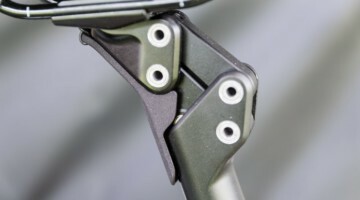 As reviewers, we always try to point a critical eye toward the products we are reviewing, but to be honest, I do not have many nits to pick with Zwift. One thing I do not like is that the hills constantly change slope by a percentage or two (versus a few tenths of a percent), so climbs require constant shifting that make it challenging to hold a constant power. Also, maybe the app could add a cyclocross course or at least a bike park? 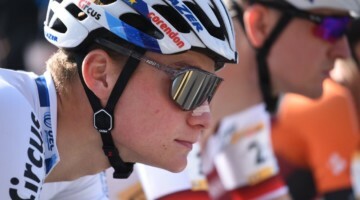 Racing Zolder or Koksijde could be fun, since virtual reality is likely the only way us mortals can experience the thrill of those tough courses lined with thousands of fans. It’s also worth noting that many of enjoy cycling because it gets us outside, away from work and away from screens. You’ll have to decide if adding more screen time just to get your heart rate up makes sense for your mind, eyes and body. That being said, if you are looking for a way to get workouts in between cyclocross races this fall or want a way to jumpstart your winter training, Zwift is worth a try. If you are not a trainer fan, Zwift might also be worth a look as a way to make indoor cycling somewhat tolerable. If you have snarked about Zwift in the past, just be warned that once you try it, you might actually enjoy it.